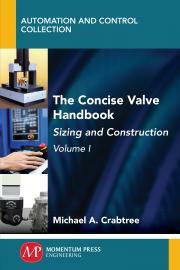 This two-volume book comprises a comprehensive up-to-date body of knowledge that provides a total in-depth insight into valve and actuator technology – looking not just at control valves, but a whole host of other types including: check valves, shut-off valves, solenoid valves, and pressure relief valves. A methodology is presented to ensure the optimum selection of size, choice of body and trim materials, components, and ancillaries. Whilst studying the correct procedures for sizing, readers will also learn the correct procedures for calculating the spring ‘wind-up’ or ‘bench set’. Maintenance issues also include: testing for deadband/hysteresis, stick-slip and non-linearity; on-line diagnostics; and signature analysis. Written in a detailed but understandable language, the two volumes are presented in a form suitable for both the beginner, with no prior knowledge of the subject, and the more advanced specialist. For the last sixteen years, ‘Mick’ Crabtree, who holds an MSc in industrial flow measurement, has been involved in technical training and consultancy – running workshops on industrial instrumentation and networking throughout the world covering the fields of process control (loop tuning), process instrumentation, data communications, fieldbus, safety instrumentation systems (according to both ISA S84 and IEC 61508/61511), project management, on-line analysis, and technical writing and communications.